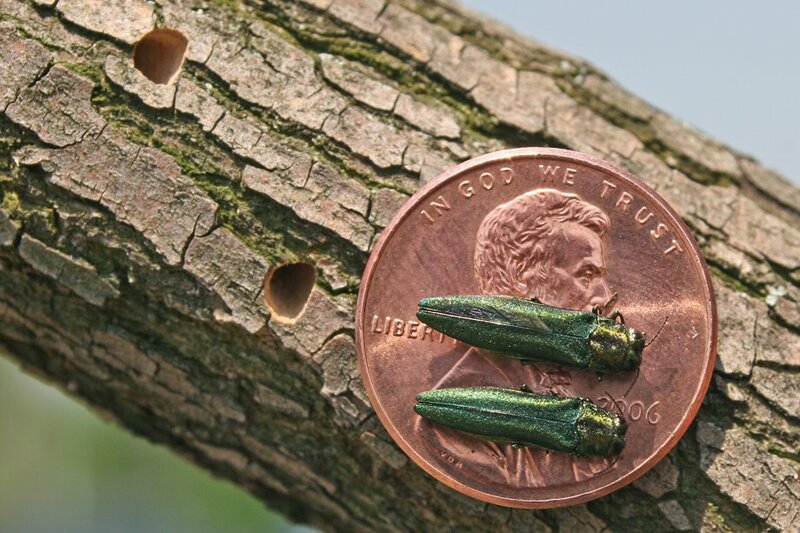 The emerald ash borer is a small insect that bores into the bark of ash trees, eventually killing them. The insect is a small beetle, approximately 1/3 inch in length with a shiny green exterior. It is native to Asia and was first discovered in the United States in 2002 in Michigan. Since then, it has spread throughout the central and eastern US and its presence in Massachusetts was confirmed in 2012. Why should I care about this insect? 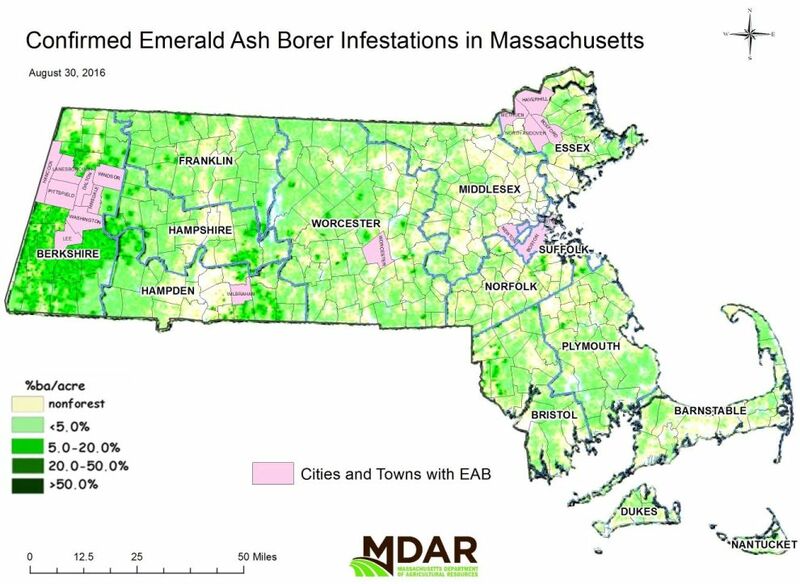 Below is a map from 2016 showing the Massachusetts towns in which EAB has been verified. Since 2016, EAB has also been found in the towns of Becket, Hinsdale, Georgetown, Waltham, and Brookline. Massachusetts forest health expert, Ken Gooch, says that tree mortality due to the emerald ash borer seems to be lower than in other infected states. However, he cautions that it can take often take a few years before an infestation causes widespread tree mortality. As of 2014, White Ash was the 7th most common forest tree in Massachusetts. The tree often has important ecological and economic roles in Massachusetts forests. Therefore, the presence of Emerald Ash Borer should be of concern to all forest landowners in the state. If you are concerned that emerald ash borer will affect your forest, you should consult with a forester who can help you create a management plan with this insect and forest health in mind. Click here to find a forester near you. Don’t move firewood. Emerald ash borer and other invasive forest pests often spread through the transport of wood products, especially firewood. It is important to make sure that the firewood you cut, sell, or buy is processed appropriately to avoid the spread of the emerald ash borer. Click here for more information about firewood laws in Massachusetts. Additionally, it is important to consider the spread of invasive species while handling and transporting any wood cut from your property. See this info sheet for more information about handling all ash products. If you see signs of the emerald ash borer in your forest, please report them to the NRC. Click here for more detailed information about the emerald ash borer in Massachusetts.